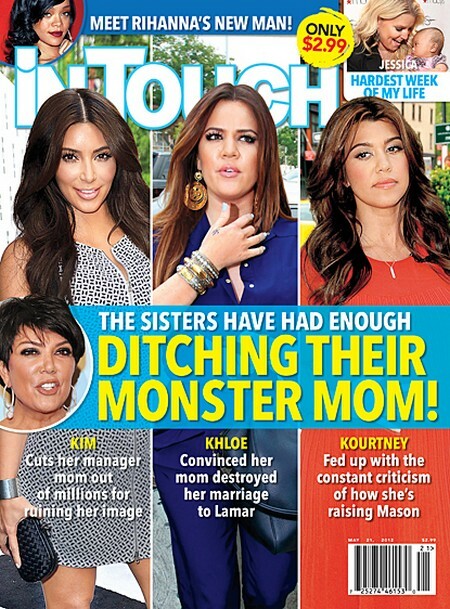 The current issue of In Touch has the bombshell story ‘Kim, Khloe and Kourtney – ditching their monster mom!’ According to In Touch the sisters Kim Kardashian, Khloe Kardashian and Kourtney Kardashian have had enough of momanager Kris Jenner stealing 10 % of their earnings. Kim feels Kris is ruining her image. It has been rumored that Mom Kris is the reason that Kim filed for divorce so soon from her husband Kris Humphries. That is just one of the reasons Kim is going to cut her out of her millions that Kris has been grabbing from her. Also included in this week’s magazine In Touch has all the details on Rihanna’s new man. There have been so many rumored men it will be interesting to see which one they will introduce us too! To find out all this and more pick up the current issue of In Touch magazine.